Foster Parents are in high demand as many of our cats and kittens require more attention due to behavioural problems, health issues etc. They also need help trusting people again. Foster parents provide the cat(s) with their time, patience and compassion. They may also take care of cats while they are ill, recovering from surgery or awaiting adoption. * Please Note: Fostering may be short term or long term. In order to foster you must be 21 years of age. Prior to becoming a Foster Parent at NCWL you will have to fill out a Foster Parent Application Form and attend an interview. 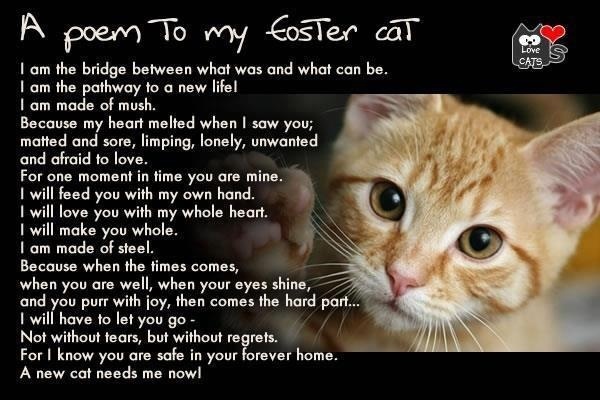 What’s involved with fostering a cat? Fostering is supposed to be fun! We rescue a cat that we believe will fit in with your home and family environment. Don’t be afraid to tell us what kind of cat you’d like to foster. We really want this to be a GOOD experience. We provide the veterinary care for your foster cat. Your foster cat must go to an approved NCWL veterinarian, with our permission. ​You provide the food, litterbox and lots of love! Often we can provide you with food that has been donated to our rescue. What happens when somebody wants to adopt my foster cat? 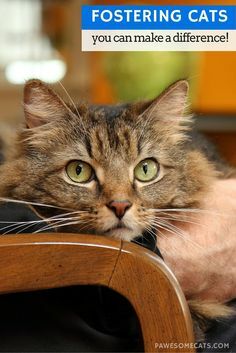 You’ll schedule a mutually agreeable time for the adopter and your foster cat to meet. If all goes well, the adopter may take the foster cat home right away. It’s really important that you contact the adopter QUICKLY. If you wait too long, the adopter will be discouraged and may go elsewhere. What are the criteria for adoption? INDOOR ONLY! We do not adopt to adopters who want an outdoor cat. NO DECLAWING! We believe that declawing is a form of mutilation. Did you know that Canada is one of the last countries that permits declawing? Most US States have outlawed it too. Our adoption fee is $195.00 kittens / $175 cats, which includes the spay or neuter, one FVRCP vaccination, deworming, flea treatment and microchipping. So now there’s an adopter – what do I do? Foster parents get final say-so as to the qualifications of the adopter. If all goes well, you’ll collect the adoption fee IN CASH. You’ll fill out the adoption agreement with the adopter. You give the adopter the cat's health record along with the adopter's copy of the adoption agreement. Forward the payment and the rescue copy of the adoption agreement to Lori Dudley. What if somebody I know wants to adopt my foster cat? What if I want to adopt? All friends and family members must be screened for adoption and pay the adoption fee. Even foster parents have to pay the adoption fee. What if my foster cat gets sick? Don’t panic! Most of the time it’s not an emergency. If you think it’s an emergency, please call Lori right away. NCWL does NOT pay for Emergency Care without prior authorization. If your foster cat needs a veterinary appointment, please contact Lori and she’ll help you AND your foster cat right away! Most of the time, your foster cat can be easily treated at home. What if I can’t foster any longer or the cat doesn’t work out in my house? Moving a foster cat into another foster home is one of the more challenging aspects of running a rescue. Unless there’s a dire family emergency, we ask if you could give us some time to arrange for another foster home. Sometimes that can take a few days or more. You will never be “stuck”. How long (on average) does it take for a foster cat to be adopted? Ahhh…the million dollar question! Sometimes a foster cat can be adopted immediately, and in other cases it can take months. We really believe that there’s a home for EVERY CAT. GREAT pictures make a huge difference. The better the picture and the better the bio the better chance your foster cat will be adopted quickly. Blurry, small pictures don’t show a cat’s full personality. Get creative and have fun! Congratulations! You’ve just saved a life. These cats need you, and we’re here to support you in your very important volunteer work. This FAQ probably doesn’t answer all your questions, so please feel free to contact us. Thank you for all you do in helping these otherwise abandoned, discarded cats find their forever home.